Hands up if you suffer from runny nose or congestion. Or maybe you have itchy eyes that are red and teary. Add on itchy throat and ears and you my friend suffer from seasonal allergies. Trust me when I say I understand, but please don’t look me in the eyes because I look like I have pink eye with my allergic conjunctivitis. The kid over there with the tissue held up to his ever-dripping nose, yeah he gets it too. My sons and I are miserable come spring for a couple of months as all our gorgeous trees in our yard remind us that mother nature can be cruel. We are looking for any help we can get…. 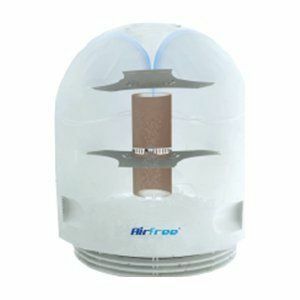 Enter the Airfree 3000 Onix Mobile Air Purifier. Air enters the unit and is heated to almost 400 degrees to kill microorganisms before being cooled down again and leaving the unit. Ozone is reduced in the air which is a bonus for asthma sufferers. Airfree destroys mold, dust mites, bacteria, viruses, pollens, pet dender, tobacco and other organic allergens. The entire process is completely silent and requires no maintenance, not even the occasional replacement of filters. All you have to do is switch on the device and let it do the job. The unit makes absolutely no noise and you never need to change a filter. It is truly a matter of plugging it in and walking away. It is very compact being about the size of a toaster and it includes a blue night light feature. We received the Airfree 3000 Onix right after the last allergy season so we had a hard time testing it. I sent it to ‘an independent tester’, informally known as ‘my dad’. My dad has dust allergies and lives in a condominium. He was super keen to try out the air purifier and has been very happy as he is able to breath much easier. The Onix easily purifies his whole space so he can be comfortable throughout his home. It was REALLY hard to steal it back from him when allergy season hit! I will say we tested the unit before our A/C was up and running. With temperatures upwards of 30 degrees the unit became very hot to the touch. It would cool down at night but the hot air going in was just too much for it. Under normal circumstances this has not been an issue. The price is a bit steep but if you suffer allergies and are miserable I would say there is value in improving your well being, especially long term. Also being able to use less medication is a bonus in my opinion. love the look of this one! My seasonal allergies are going crazy right now. I’d love an air purifier like this one. That’s amazing that you don’t ever have to change a filter! Thanks for the review! This sounds great thanks for the review,i always have a runny nose or congestion…. Thank you for the review. We have been thinking about some type of air purifier and will put this type into consideration. I’ve been wondering what I could do in case someone moves in under, or next to me, who smokes. The air is circulated among the units, I’ve been thinking of moving. One person moved who smoked, and how much better – so I have no idea what is next. This would be worth trying, and it is so small, not big ‘n ugly. and cheaper than selling and moving. This air purifier sounds perfect! I love the fact that it uses heat to destroy microorganisms, and it’s great that you don’t ever need to change a filter. Thanks for the review! This would be nice to have as I do have allergies and beside that I have a cat that also does not help with my stuffiness. I may need to look into something like this for myself.